Lin Junde and Zhang Chao joined the list of exemplary PLA soldiers in September under the approval of the Central Military Commission. Before the addition of Lin and Zhang, the list included eight exemplary soldiers known to everyone in China, such as Lei Feng. Their portraits were released by the former General Political Department of the PLA and hung in all offices above the company level. They were role models from different times in China and represent the spirit of their eras, and their heroic acts offer lessons to the entire army. 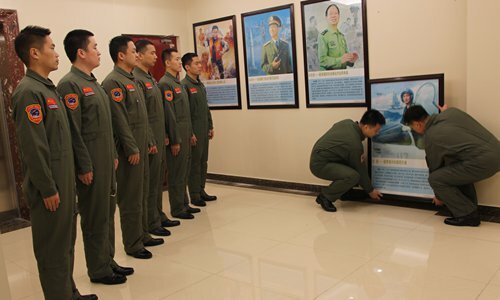 Zhang was a first-grade pilot of the naval air force in Hainan who died at the age of 29 during J-15 fighter jet carrier-landing training on April 27, 2016. 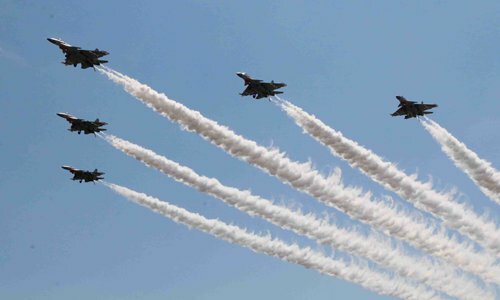 Zhang's addition to the list is high praise and an honor from Chinese President Xi Jinping and the Central Military Commission, as well as an encouragement to all soldiers of the naval air force in the Northern Theater Command. The decision also shows that President Xi and the Central Military Commission attach significant attention to carrier-based flight and wish to expedite the transformation and construction of the naval air force. Carrier-based pilots have been called "dancers on the point of a knife," as they are under unimaginably huge pressure when an aircraft weighing dozens of tons hits the deck and reduces its 200-kph speed to zero in a very short time. No matter how experienced a pilot is, every take-off and landing on the deck is as risky as the first, and even a tiny error could lead to calamity. Carrier-based flight intimidates some people with its unknown risks, while attracting others with its challenges. Obviously, Zhang was among the latter. In December 2013, Zhang became a pilot of China's third-generation fighter jets in the naval air force in Hainan after a series of strict tests. Although it was the first time for Zhang to pilot a third-generation fighter jet, the idea of challenging himself by flying the jet and piloting it in the best way inspired him. On the morning of April 27, 2016, a silver J-15 fighter jet approached and landed on a carrier-based craft training base. The flight was supposed to wrap up the morning's simulation training, and everything was normal until a harsh alarm was issued from the radio. Yu Xiang, the machinist standing by aside the field, saw the jet heading nose-up and flying straight up into the air as it tried to slow down. "Jump! Jump! Jump!" the director instructed. Zhang was ejected from the cabin as the director gave the order and fell onto the runway. The flight record shows that while the jet was out of control, Zhang's immediate response in the six seconds was to preserve the jet. However, the plane remained out of control. Zhang died at 29, after being sent to the hospital, because his parachute failed to open due to improper ejection position and low height. "After seven flights, he would have been a pilot on the Liaoning," said Xu Ying, chief of the training base, as well as the first pilot to fly the J-15 fighter jet for the inspection of President Xi last year. "Zhang paved the way for China's aircraft carrier goals with his life, and we should complete his unfinished career to devote ourselves to building a naval air force," said Sun Mingjie, a newly approved pilot on the aircraft carrier. "Zhang was a pioneer of the new combat forces of the PLA, as well as a hero who sacrificed his life for China's aircraft carrier cause," said Zhang Zhongming, political commissar of the training base. "We will strictly observe the iron discipline of 'precise, obedient and zero tolerance' in aircraft carrier flight, fight against bottlenecks, endeavor to solve the critical issue, forge a powerful engine for the construction of the naval air force, and complete the unfinished cause left by Zhang Chao," announced Lu Chaohui, head of a carrier-based jet fighter regiment, on behalf of all the pilots.